The Reds have apparently signed Brett Tomko to a minor league deal, which is completely awesome. It appears that the club is still negotiating with Jimmy Haynes, however. I know this is totally a minor signing, but it makes me happy. After the Marshall trade, I was VERY worried about SP depth. Between this signing and Francis, the Reds can sustain a pitching injury or two before it gets really messy. That Dusty will probably run him out there every 5 games just because he is a veteran!?!!!! What’s Pete Harnisch up to these days?? Minor league depth, why not ? Sort of on topic/sort of not, but if by some miracle Chapman pitches completely lights out through Spring Training, what does the Opening Day rotation project as, assuming Chapman will be in it? Who among Arroyo/Leake/Bailey would go where? Would someone go to the ‘pen? Would someone get sent down? Bailey probably can’t go to the ‘pen since it takes him forever to warm up…..
Just curious what people’s thoughts are. @CI3J: Leake has options and would probably be sent down. My friend texted me about the Tomko signing, and I reminded him that he was still better than Jimmy Haynes (and probably wouldn’t pitch for the Reds this season). I remember when Haynes was one of our five best starters. Ugh. @Travis G.: One of our best five? Hell, Haynes was our opening day starter a couple of years. Oh, the good ol days. Paul Wilson, Seth Etherton, Scott Sullivan, Pete Harnisch, and my favorite, Danny Graves. Hey now – I don’t know if you meant this in a derogatory way, but all these guys (except Etherton) had good years for the Reds. 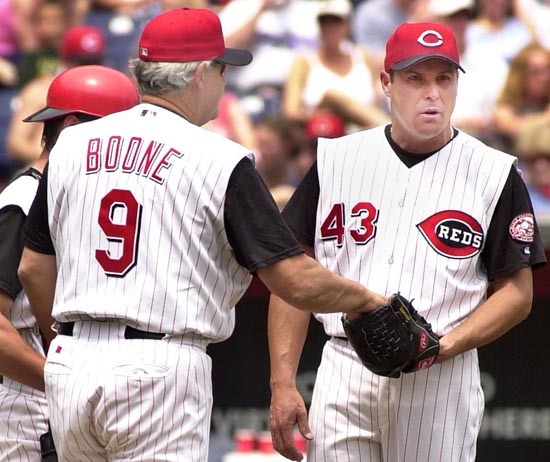 The ones who personify the dark days of the early 2000’s Reds pitching staff are Jimmy Haynes and Jimmy “8.84 ERA” Anderson. The ones who personify the dark days of the early 2000Ã¢â‚¬Â²s Reds pitching staff are Jimmy Haynes and Jimmy Ã¢â‚¬Å“8.84 ERAÃ¢â‚¬Â Anderson. Even Jimmy Haynes first year in Cincinnati wasn’t bad results-wise. (Made 34 GS, 17 QS, 15 wins, 4.12 ERA, 105 ERA+.) b-r.com has him as a 2.5 WAR player that year making only $500k. The problem was all his peripherals screamed that 2002 was non-repeatable, and Bowden’s idiocy of giving him the 2-yr, $5-million deal. The new stadium caused a spike to his HR-allowed rate, and he posted a -2.7 WAR in just 22 starts over the next two seasons. I am continually amazed at how people think Chapman will be anywhere near ready or able to pitch as a starter by the end of ST. It would be a disservice to him and the team. He needs at least 2-3 months in AAA to work on things before he is anywhere near ready. Hint: the phrase, “but if by some miracle” might indicate the poster doesn’t actually think Chapman will be ready. @Redsfanx: Not unless they were going to ask Roy to pitch in Louisville until they need him. Tomoko is just about depth, not production. It doesn’t matter how you define ‘good years’; when your opening day starters are Paul Wison and Jimmy Haynes, your season is hit in the mouth…. And I don’t know how anyone could have thought the Graves experiment could possibly have anything other than “Iceberg dead ahead” written on it. It is a nice feeling to know that we may be sending guys to the minors who could have started opening day a few years back. @preach: Never again will a guy whose out pitch was the slurve be a closer. I don’t know that was the case but it certainly seemed to be as a teenager watching Graves come into the game and proceed to dig his own. Even if Chapman makes the starting rotation after a miraculous spring (note the use of “miraculous”) I still see Leake as making the starting rotation, unless he has a terrible spring. He was the Reds 2nd best starter last season. What he has accomplished in two pro seasons is underrated, even by Reds fans. And don’t even mention the bullpen for him – he likes to pitch on a regular basis and did not pitch well out of the pen in his limited experience there. I actually genuinely liked all those guys.